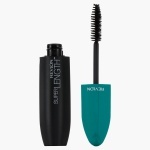 Available in an adorably designed container, this waterproof mascara enhances the appeal of your make-up. It provides a beautiful long-lashed effect for a mesmerising look. The tapered brush allows for even application.